BellyFit Live offers a fun way to get active and support local charities at the same time. If you were seeking a problem that is causing more confusion and diversity of opinions in the Comox Valley than ‘Hospital Angst’ you would be hard-pressed to find one. Some want it here; some want it there; some want one great big one to serve Campbell River and the Comox Valley, rehabilitation and even others want two brand new ones—one in Campbell River and one in the Comox Valley. Meanwhile, any proposed siting has become an exasperating quandary due to the fact that the original Vancouver Island Health Authority (VIHA) approved site was kiboshed by the federal government due to airspace and flight-path woes pertaining to CFB Comox. An alternate setting for the facility is yet to be decided and wherever is decided, Cumberland will invariably want it closer to that community. 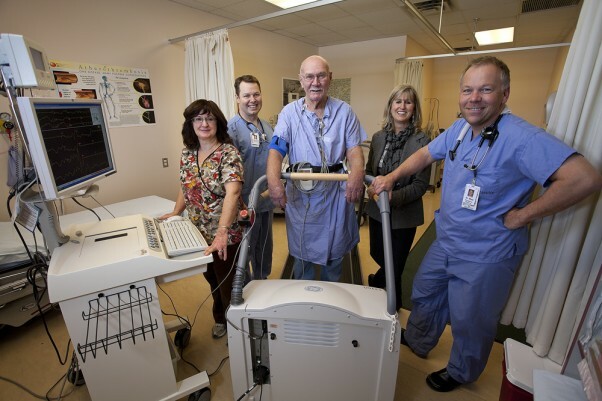 The Foundation raises funds for vital hospital equipment such as the GE treadmill above, used for cardiac stress testing. Above, 85-year-old Walter Wilson tries out the treadmill under the watchful eyes of (left to right) Beth Cosgrove, Chief Therapist Craig Dickson, Lynn Dashkewytch and Dr. Jason Wale. Meanwhile, St. Joseph’s Hospital sits in the middle of all this consternation and must continue to carry on effectively until some sort of resolution is reached—sooner or later. And persevering with her task—the primary one of which is fundraising—is Lynn Dashkewytch, the Executive Director and administrator of the St. Joseph’s Hospital Foundation. While St. Joe’s (which has been the pillar of in-patient and out-patient medical services in the Comox Valley for just one year shy of a century) receives its major funding from the provincial health ministry via the Vancouver Island Health Authority, many of its vital equipment needs are filled by the Hospital Foundation, and hence the people of the Comox Valley and other communities that use the hospital’s services. It’s important that the public understands the differences between the operating budget of the hospital per se and the role of the Foundation in the overall picture. She explains why such funding is necessary, even though the provincial government funds healthcare. “Every year VIHA receives funds for capital equipment purchases from the provincial government and allocates them across the Island,” she says. While she understands the confusion that arises over funding, she emphasizes that the way in which the hospital can stay up-to-the-minute in terms of medical technology is for the public to help as much as it can afford to and the Foundation endeavors to make that task as easy as possible. “The input of the public has a vital role in the level of care,” she emphasizes. She cites as an example of this the 200 employees that donate $5 to $10 per paycheque for the staff lottery. A year of this results in more than $25,000 for staff education and equipment. She adds that in the last five years the Foundation has raised more than $2.5 million and has transferred $1.5 million back to the hospital to purchase equipment and to support capital projects. Those funds came from service club, grants, community events, estate gifts and members of the community. In that way almost all of St. Joe’s departments were supported in one form or another. For example, in 2010/2011 one of the Foundation’s goals was to raise the $195,000 needed for GreenLight™ Laser Therapy and a scope for the operating room. The therapy is used to treat benign enlargement of the prostate. A therapy that once took up to seven days of hospital stay as well as an invasive and not very pleasant procedure is narrowed down to less than seven hours and is non-invasive. She notes that with the help of the St. Joe’s urology team, a former patient, an anonymous donor, the Comox and Courtenay Legions, as well as many individual donations, the goal was attained and nearly 100 of these procedures have been performed. “Every department in the hospital affects the lives of people in our community and they, in turn, help us to enhance the equipment and services provided,” Dashkewytch says. While health care is predominantly about the ‘front line’ of patient care, Dashkewytch knows well how vital the ‘people’ behind the therapies are. And, while she is unstinting in her praises for the medical staff at all levels at St. Joe’s—from the physicians and specialists through the nursing and laboratory staffs, as well as the administrators—she finds that the human face the Foundation can offer is a vital part of that mix. The Foundation newsletter, which is published biannually in the Echo newspaper as well as home mail-outs convey not only the happenings of the Foundation and the hospital in general, but also shares stories by former patients and their families about the vital role the generosity of the public played in their personal medical crises, whether it’s Green Light Laser Surgery or the Holter Monitor. Going under the general title of Caring Spirit, contributions to this legacy of tales is open to any former patient who is grateful for the care that was shown either to themselves, or to a loved one. And while the stories are valued by the Foundation, so is any financial contribution. Readers interested in learning more about Caring Spirit and how they might lend a hand, if so inclined, can contact the Foundation. For Dashkewytch to be in the position in which she now finds herself involved a somewhat convoluted course to get to a place that seems to be such a natural fit for an individual who is a self-professed “people person.” She is certainly far removed from her original career, where she was the Kootenays territory representative for Molson Canada. The Kootenays are home—she was born and raised in Kimberley, BC. The advertising sales component of her Molson job demanded a level of comfort in dealing with a diverse public. Yet, when she left Molson in 2003, after 10 years with them, she made what would seem like a quantum leap—from a business involved in the manufacture and distribution of potent potables, to the Salvation Army—a realm that sometimes deals with individuals who have run afoul of those same potables. How does such a change happen? It came about after a move to Campbell River where she, her husband Paul, who had taken a position as manager of the Storey Creek Golf Course, and their two sons, decamped. Once there she had to decide what she wanted to do. Initially all she was seeking was a volunteer position and she found that with the Salvation Army in that community. The job primarily involved working with unemployed clients on needs assessments in the community. There she found the marketing skills she’d employed in her former work helped her immeasurably. While she liked the work well enough and found it challenging in a positive way, and genuinely embraced the plights of some of her clients, the family decided to seek a move to the Comox Valley, especially after her husband took the position he still holds, as manager of Glacier Greens Golf Course. Once again Dashkewytch was left needing to find a position, but that wouldn’t remain the case for long. And then it happened. A business contact in Victoria told her that St. Joseph’s was looking for somebody to head up their Foundation and thought it would be right up her alley. So, in May 2007 the association began and she has never looked back. That being said, Dashkewytch was to find out early that the task was no small one. In the first place, she wanted to put her imprint on the position and, at the same time had to fulfill the criteria of the job description. A description that includes raising funds, sustaining and enhancing quality health care, increasing awareness of the Foundation as a vital conduit to the hospital’s services, building the financial capacity of the Foundation, liaising with the greater community, encouraging and providing access for individual and corporate donors and encouraging grant bequests. As an example of some of the work that has been done in recent months, some 16,000 mailers have been sent out to the public (of which, this year, as a reflection of the economy, combined with confusion over the ongoing hospital(s) debate, only some 600 positive responses have been returned). Dashkewytch fully understands the confusion around the hospital situation and what the future holds for the community. She stresses, however, that regardless of what final decision is made on the siting of a future facility, any purchases made (with the public’s welcome assistance) by St. Joe’s will be transferred to the new hospital, so no expenditure will be redundant. So, for Dashkewytch life is now a matter of getting the message out as much as anything else. St. Joseph’s Hospital is alive and well and thanks to the welcome contributions of the public, former patients, service clubs and other groups the Foundation is enabled to play a vital role in keeping up-to-the-minute in terms of clinical technology, which enables hospital staff and medical specialists to carry out therapies that are so vitally needed by the population it serves. And until such a time as a new hospital comes into being and equipment is transferred to that site, any and all contributions and bequests will continue to be welcomed. “It’s the success stories that continue to keep me vitalized and loving my job,” Dashkewytch says. For more information about the St. Joesph’s Hospital Foundation and how you can help please email: foundation@sjghcomox.ca or call 250-890-3046. Yet, women’s bodies are designed to move, and the health benefits of aerobic exercise are undeniable. Lower cancer rates, better quality of life and improved mental health are just a few of the things we know regular exercise does for us. And it doesn’t matter how we look doing it, or what our bodies end up looking like. It’s the doing it that counts. That’s the whole point of BellyFit, a growing holistic fitness system for women developed by Alice Bracegirdle in Victoria, BC in 2003. Her unique program blends Cultural Dance, aerobic fitness, body philosophy and deeply motivational and inspirational ethno-electronica in a sort of fitness fusion intended to promote health through movement, empower women, and create a positive body image—all the while having fun. Leanne Zdebiak-Eni leads the January BellyFit Live event at the Native Sons Hall. The event was a fundraiser for True Colors Youth Company of Performing Arts, the only pre-professional dance troupe on Northern Vancouver Island—it raised $413 for the company, as well as 200 pounds of food for the local Food Bank. The next event will be held March 11 in support of YANA, starting at 11:30 am at the Native Sons Hall in Courtenay. Leanne Zdebiak-Eni is the Comox Valley’s first BellyFit Instructor, and has been offering classes through her fitness studio Island Fitness Pilates (IFP) since 2008. As owner and operator of IFP, she’s seen the impact the classes have had on her clients over the past three years. And now she has partnered with local DJ em.ash (who goes by the name Michael Holding when he isn’t playing music) to create a community fundraising event that shows just what women can do when they move. “A friend emailed me and said ‘You’ve got to try this!’” says Zdebiak-Eni when asked how she learned about BellyFit. At the time, Bracegirdle and her partner Rowan Sentesy were conducting their first instructor training courses as part of their effort to grow BellyFit as a business, and the pair made the trip up Island to put on a demonstration class. “I was totally sold after that,” says Zdebiak-Eni. The classes certainly came at a good time. Zdebiak had recently moved her studio from Comox to a much larger space on Cliffe Avenue in Courtenay. The move afforded her the opportunity to go back to her roots as a group fitness instructor after years of teaching just Pilates. There was finally the space to have a room full of moving people. What attracted Zdebiak-Eni to BellyFit was the holistic qualities of the classes. “It’s a total mind/body exercise—and that doesn’t always happen when women are exercising. They’re not always aware of their feelings and emotions,” she says. “Women and young girls are presented with so many opportunities for a negative self-image that anything that encourages women to feel good about themselves is wonderful. “And it gives women permission to move their bodies in ways our culture doesn’t always encourage,” continues Zdebiak-Eni. A typical BellyFit class includes shoulder shimmies, hip sways, and the sort of all-round jiggling most women are embarrassed to do. However, that’s the appeal. That soulful quality might explain how Zdebiak-Eni eventually found herself organizing a BellyFit fundraiser for Jennifer Zahavich, the young Comox Valley mother diagnosed with breast cancer in 2007 and who passed away in 2011 at the age of 31. Despite a short remission in 2009 after successful radiation and chemotherapy treatment, Zahavich’s cancer re-emerged in 2010. Because of the nature of the new cancer, doctors told her there was nothing they could do. Zahavich sought naturopathic treatment rather than give up, and many in the community rallied around her to raise funds to cover costs of the alternative care. Zdebiak-Eni is one of the people who offered help, making her studio and class time available to raise funds. The offer turned into a heartfelt event that raised $1,200 for Zahavich. “That spawned for me the importance of community and how important BellyFit can be,” says Zdebiak-Eni. “It really showed me that we can do important stuff with this. Enter BellyFit Live classes, where a BellyFit instructor teams up with a DJ to create an interactive fitness experiences. The Live events have always been a part of the BellyFit experience as a way for groups of women to come together and celebrate the two most important parts of BellyFit—music and movement. The live music adds a cooperative element to the class, where DJ, instructor and participants work together to create the experience. Zdebiak-Eni decided these live events were the right vehicle to share what she felt when supporting Zahavich with the larger community, all the while raising funds for various community organizations. As luck would have it, there were a couple of local DJs nearby—literally downstairs from IFP at Sure Copy and Design Centre. Owner Adil Amlani is a local music producer and DJ who introduced Zdebiak-Eni to his employee and fellow music producer and DJ em.ash (aka Holding). The two talked about BellyFit and what Zdebiak-Eni hoped to accomplish, and Holding decided a live community fundraiser was just the sort of thing he wanted to be a part of. In fact, the goals of BellyFit match well with the electronic music culture of the Comox Valley—which, if you didn’t know, has been thriving in the Valley for nearly 20 years. Holding insists the electronic music scene has the hottest dance floor in the Valley (check out the Mexx on Friday nights, he says). What makes it hot is its two basic principles—respect and safety. That means respect for who you are or whoever you want to be, and the safety to feel whatever it is you need to feel to dance. With a DJ on board, Zdebiak-Eni started planning the first Comox Valley BellyFit Live Community Celebration. Keeping with the women, girls and fitness theme, the first event raised money for Girls on the Move, a program run through the LINC Youth Centre that helps girls get fit and make health nutritional choices. Comox Valley’s first BellyFit Live was held at the Native Sons Hall, and raised $577. Beyond the actual dollar amount, the experience also kicked off the sort of community support Zdebiak-Eni wants to see. The Courtenay Recreation Association (which runs the LINC program) was impressed enough to offer the Native Sons Hall up for use if Zdebiak-Eni wanted to continue the Live events. And local business Lotuswear came onboard as event sponsor, opening the door to other businesses to offer door prizes for participants. So in December Zdebiak-Eni, with music support from Holding, held a fundraiser for the Comox Valley Christmas Hamper fund, raising $376. And in January, the event was for True Colors Youth Company of Performing Arts, the only pre-professional dance troupe on Northern Vancouver Island. That event raised $413 for the troupe and 200 pounds of food for the Food Bank. The next event will be held March 11 in support of YANA, and will run from 11:30 to 1:00 pm at the Native Sons Hall. Entry is by donation, and participants are asked to wear indoor running shoes. The variety of charities and non-profit groups add a different character to each of the BellyFit Live events, however, the motivation stays the same. And that is what women can do when they move. For more information about BellyFit, BellyFit Live and Island Fitness Pilates go to: www.islandpilates.ca. To hear DJ em.ash’s music go to: www.soundcloud.com/emash.